Make a multi-photo birthday card in the scrapbooking style! Get ready to amaze your b-day person! Unite multiple pictures in one party collage. 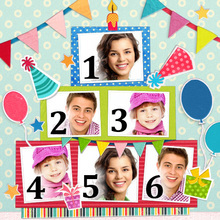 Congratulate your friends with a cute birthday greeting card personalized with their own photos!